Update 2 - September 18th: It's official - Lawbreakers has been taken offline. That's according to senior environment artist Josh Rife who posted on Twitter that the closure had occurred on schedule. Update 1 - June 11th: Publisher Nexon has confirmed that the servers for Boss Key's LawBreakers will be closed down on September 14th. In a post on the game's website, the publisher said that the game would be free-to-play ahead of that date. "In light of the unfortunate news regarding Boss Key Productions shutting down, we regret to announce that we will be sunsetting our support of LawBreakers on September 14, 2018 as we are not able to operate the game," the company wrote. "Our servers will remain open until then and the game will be made free-to-play on Steam for all players effective immediately. Please note that any and all new in-game purchases will also be disabled and we will not be able to accept any refund requests. "We truly appreciate your understanding in this difficult time and we want to thank you all your support and being a part of the passionate LawBreakers community." Original story - June 11th: Boss Key's arena shooter project LawBreakers appears to have changed to a free-to-play business model. As spotted by Resetera user Madjoki, the game's store page on Steam has moved from a premium model to that of a free-to-play title. Work on LawBreakers ceased in April after the game failed to take off following its August 2017 release date. When the game was axed, BossKey said that a move to free-to-play would have been too costly, and thus it would not be pursuing such a business model. Why the game has moved to free-to-play now is unknown; neither is whether this is actually intentional. 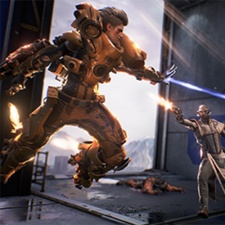 When it was initially in development, LawBreakers was a free-to-play game, but Boss Key opted to move away from the model because the team felt it wasn't conducive to a fun experience. Boss Key moved on from LawBreakers in April and launched free-to-play battle royale title Radical Heights into Early Access. That project failed to gain any traction and the studio announced it would be closing last month. Why Lawbreakers failed to take off is still a hotly-debated subject; some say that the team/arena shooter market had already been dominated by Blizzard's Overwatch, while the game's publisher Nexon believes Playerunknown's Battlegrounds is to blame. That company pulled support for the game back in January. We've reached out to Nexon to find out more.